The first moment I saw my foster son, “Baby S,” he was 16 months old, perched on his caseworker’s hip in my entry. It was 7:30pm on a Wednesday, and he had just been removed from the home of relatives who were no longer willing to care for him. Instead of joy, or the instant, visceral love I felt in my first moments with my biological children, I felt nothing—except perhaps a tinge of regret. I looked at that sweet, vulnerable boy and saw a stranger. Foster adoption is something I have always felt called—or perhaps a more appropriate word is pushed—to do. The only way I can describe it is that I wanted to want to adopt. I wanted abused, neglected, and abandoned children to find loving, permanent homes—in theory, anyway. But, if I was honest with myself, I never quite felt up to the challenge. Here’s the thing: I believe we are here to be of service—to be instruments of God’s love. The problem is, I struggle to understand the difference between stretching myself to rise to challenges and forcing myself into situations that I am not equipped to handle. In this case, despite grave misgivings about my capacity—both emotional and logistical—to handle another child, I trudged along what I believed to be the right path. The first weeks with Baby S were some of the most difficult of my life. He was an adorable child—with twinkly eyes, a giant smile, chubby cheeks, and deep, deep dimples. He laughed easily and hugged freely. He went to sleep without a fuss, slept a solid 11 to 12 hours every night, and ate everything I cooked with enthusiasm. But he was also needy and very active. He never settled unless he had the full attention of an adult. Shortly after he joined our family, I came down with a cold, which developed into bronchitis, and was feverish for weeks. But there was no rest; there were only long days of chasing Baby S. It was impossible to cook a meal, empty the dishwasher, or fold laundry unless he was asleep. While the rest of my family was on a honeymoon with the new baby, I was frustrated, overwhelmed, and convinced that we had made an irreparable mistake. I couldn’t walk away from a child I had committed to, but I also couldn’t imagine parenting him for the rest of my life. I was angry at myself for forcing my family into this untenable situation. It was in the depths of this misery and self-loathing that I fully surrendered to God. I asked God to guide my steps—to help me find a graceful, honorable resolution to the situation. I also asked for forgiveness—for not being the mother I hoped I could be. In this surrender, I understood, for the first time, the meaning of grace. I felt God’s love surrounding me; I was bathed in it. And I finally accepted that God loved me—me!—in my flaws and misgivings and resentment and exhaustion. God loved me even though I didn’t want to be Baby S’s mom. God loved me even though I didn’t want to be Baby S’s mom. If God loved me, then I could do my best to love myself through this crisis. I could start by telling the truth about how I felt. I told the social worker and my husband that I wasn’t sure about adoption but that I was willing to be there for Baby S. The social worker told me not to worry about adoption, because it might or might not be an option. She asked instead that I focus on being his foster mom. The relief of telling the truth and the freedom from the weight of forever allowed me to finally do that. Baby S was sick a lot—we learned later he needed adenoid surgery and ear tubes—and this added to the stress of caring for him. His fevers spiked above 103 on several occasions. His antibiotics caused bad diarrhea and rashes. And his nose was constantly, constantly running. But it was because of his constant illness that I finally found the connection to my sweet boy. I remember distinctly the moment everything shifted. It was late at night, and he woke up fussy with a low-grade fever. Mucus was pouring from his nose, and his diaper was dirty. I wiped his face with a warm, wet rag and changed his diaper. Then my husband held him still while I used a disgusting suction tool (the kind that requires you to create the suction with your mouth) to clear his sinuses. As I forced myself through the unpleasant task, it hit me that I was loving this child. With my first two children, it was the overwhelming feelings of love that had motivated me to do all the work of caring for them. With Baby S, it was doing the work of caring for him that built the love. It was the love. The love grew, he became part of our family, and I started to feel like maybe, just maybe, I could do this. Then, eight weeks into our lives with Baby S, we learned that his relatives had a change of heart, and he would likely be leaving us. There were regulations and caseworkers and bio parents and judges and slow state processes in the way of any definitive answers, but all signs pointed to a departure. The resolution I had prayed for when I was at my most desperate, was now a devastating blow. Letting go of this child I had grown to love was more difficult than finding the strength to love him in the first place. All I could do was bathe him in love, the way God bathed me when I needed it most, and hope it would carry him through the transition. All I could do was offer grace to his family, the way God offered it to me when I began my journey with Baby S. All I could do was take each day as it came. On July 20, 2015, exactly nine months after he joined our family, Baby S was reunited with his relatives. I miss him deeply and desperately. And I wouldn’t change one moment of the experience. Because God found a way to teach me what I needed to learn about love through a precious little boy. 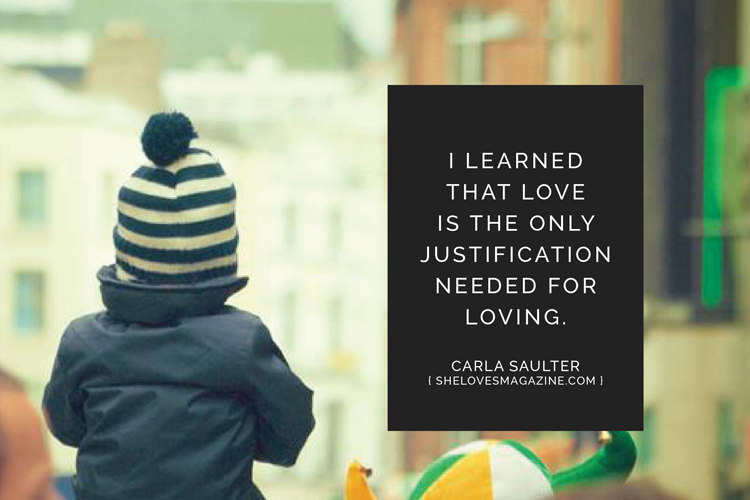 I learned that love is the only justification needed for loving. 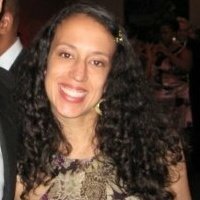 Carla Saulter is a wife, mother, writer and (bus) rider from Seattle, Washington. She is passionate about love, justice, community, Toni Morrison, and trees. She chronicles her bus-based life on her blog, buschick.com.